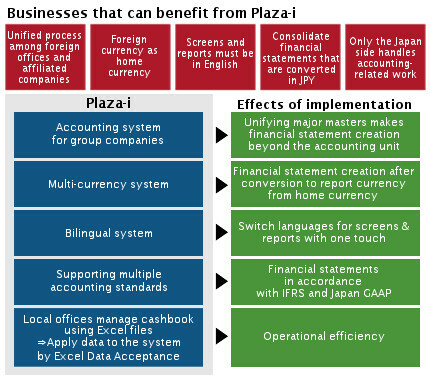 Plaza-i is highly valued by Japanese companies expanding their businesses overseas, supporting bilingual and local currency functions in accounting as well as in sales-related operations. Even when the Japan side does actual operations, Plaza-i will output English reports and financial statements in local currency. If you are thinking of overseas expansion, it is essential for your system to support bilingual and base/foreign/multi-currency functions. It is difficult to carry out and manage a unified process among foreign offices and affiliated companies. Non-Japanese-speaking local staff cannot use the current system in a Japan office since it supports Japanese only. The Japan side keeps accounts since only sales personnel is assigned overseas. Each office uses its own currency and they must keep accounts in English. Having no suitable software, they use Excel files, but it is very time-consuming and easy to make mistakes. It is troublesome when staff take over the duties of others. Consolidation process is not supported. locally-made system is good enough for the purpose of processing individual accounting processes; however, the consolidation process is necessary for a consolidation object company and the Japan side must dedicate their time to perform consolidation adjustments for financial statements reported by the local accounting standard. Prompt and accurate analysis is not possible by Japanese staff since only the local language is supported in most cases. Since the system is not equipped with bilingual or multi-currency functions, it cannot support accounting processes required for overseas subsidiaries. Supporting bilingualism and multi-currency as standard functions, Plaza-i performs consolidating processes and is a good match for foreign subsidiaries.In addition to simple use in foreign countries, remote access is possible from overseas locations to the server in Japan. Plaza-i secures a system where headquarters in Japan is able to check processes in foreign subsidiaries and affiliated companies in details. Providing the functions of Excel acceptance and Ledger style entry, Plaza-i makes operations efficient; the Japan side handles bookkeeping by accepting an Excel file of cash and bank account books of local locations.